Be stars are B type stars, very hot and bright (as can be Rigel in Orion for example), but that sometimes present emission lines in addition, telltale sign of the fact that they are surrounded by a disk of matter. What is an outburst ? These outbursts remain a topic of scientific interest as regular observation campaigns enable to follow their evolution, giving new insights into the singular physics at work in these stars. The Bess database identifies more than 2300 Be stars, from whom 1100 have no spectrum recorded. Each month, the Bess newsletter is written by Valérie Desnoux and reports the observations of the month. 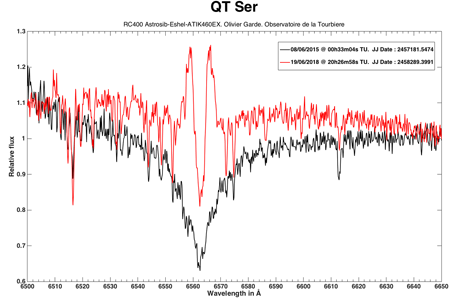 It indicates the current outburst and the evolutions of the profiles of the H Alpha line. 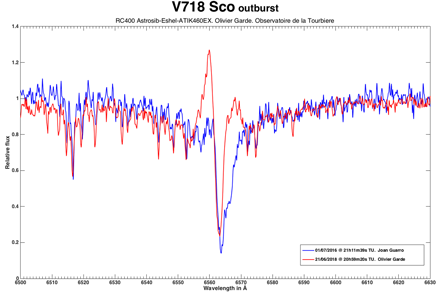 This news letter is broadcasted on the spectro-l list and astronomical_spectroscopy@yahoogroups.com list. How to detect an outburst? You can also participate in “chasing” outbursts of Be stars whether with an Alpy, Lisa, LHIRES III or eShel II. • With an Alpy or a Lisa, you will be able to highlight the big outbursts and follow them over time (passage of an absorption line to a emission line) and thanks to their high luminosity, these 2 spectrographs will be able to realize spectra of stars whose magnitude is lower than 8-9 (limit of high resolution amateur spectrograph). • With a LHIRES III or an eShel II, you will be able to detect the very beginnings of this kind of event, and see also their evolution over time with great details in the structure of the lines of Balmer. We can also highlight significant variations from one day to another. Red: It is necessary to observe it without delay. Moreover, in arasbeam, a large number of stars do not yet have a spectrum in the spectral database, they are essentially stars whose magnitude is lower than 8-9 and more particularly accessible to LISA or Alpy spectrographs. 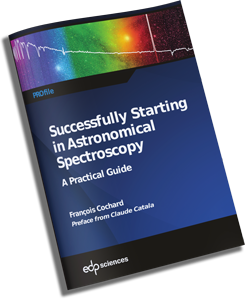 By doing their first spectrum, you will discover the state of the star when you see the spectrum on your screen: is the line in emission ? Is there an evolution from the last spectrum of the database? You will be able to raise doubts about their state and contribute to better know the star, even to calculate a periodic cycle of outburst. Your spectra can be deposited in the Bess spectral data base.